First used in the early 1960s, the P-3 Orion was the leading aircraft for United States Navy maritime and anti-submarine reconnaissance over the course of nearly four decades. Many of these aircraft were modified for the collection of electronic intelligence, or ELINT. In 1998, an aging P-3 fleet went through renovations, returning to the skies in the form of the EP-3E Aries. The latter would become involved in an infamous incident involving U.S. reconnaissance over China, a task to which the P-3 had once been deployed. Replacing the P2V Neptune, the P-3, originally designated P3V, was built by Lockheed and based on the design of the L-188 Electra passenger airliner. The only external differences between the Orion and the Electra were the unpressurized weapons bay forward of the wing, the shorter fuselage, and the magnetic anomaly detector or MAD, a security device, on the tail. Excellent at short takeoff and general handling, the P-3 could readily be modified for the purposes of gathering ELINT. In the latter capacity, it was equipped with direction finders, radar signal analyzers, and other systems. The first operational flight of the P-3 took place during the Cuban Missile Crisis in October 1962, and during the Vietnam War, several squadrons of P-3s monitored North Vietnamese boats as part of Operation Market Time. In 1963, the Central Intelligence Agency (CIA) converted three P-3As into reconnaissance platforms for use against the People's Republic of China, and these were deployed with Republic of China Air Force markings. During the 1980s, the U.S. Customs Service began using the P-3 to combat drug trafficking. In 1998, the Navy began updating its aging P-3s, and from these efforts emerged the EP-3E, an airborne radar platform. On April 1, 2001, a Navy EP-3E with a crew of 24 (22 navy personnel, as well as an air force officer and a marine) collided with a Chinese fighter jet off the China coast. The Chinese pilot was killed in the crash, and the damaged U.S. plane landed on nearby Hainan Island. The administration of President George W. Bush called for the immediate return of the plane and crew, but the Chinese ended up holding them for 11 days. Bishop, Chris, ed. The Encyclopedia of Modern Military Weapons: The Comprehensive Guide to over 1,000 Weapon Systems from 1945 to the Present Day. New York: Barnes & Noble, 1999. Bonds, Ray, ed. The Modern U.S. War Machine: An Encyclopedia of American Military Equipment and Strategy. New York: Military Press, 1987. "Hainan Incident Increases Pressure in Sino-U.S. Relations." Defense Daily International 1, no. 2 (April 6, 2001): 14. "Upgrades for P-3s to Begin in 1998." Aviation Week & Space Technology 146, no. 13 (March 31, 1997): 33. 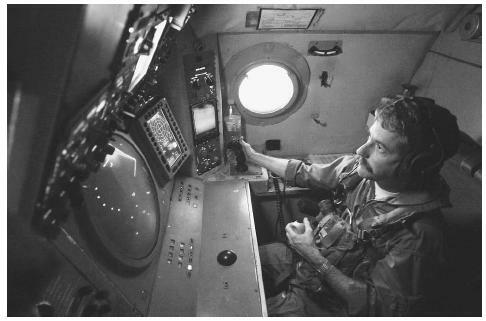 A U.S. Navy aviation systems warfare operator searches for and tracks surface contacts using radar and the Infrared Detection System of his P-3 Orion patrol aircraft during a routine flight in support of Operation Enduring Freedom in October 2001.